of the items you wish to buy. [regular] mail or registered mail. Send us your mailing address. Prices shown are net-prices in Euros. to Commemorate "Depopulated Villages around 1948"
Size of the sheet is 29.20 cm x 21.00 cm, - 11.5 ins x 8.25 ins. 100% of sales revenue goes towards Palestinians in need. to Commemorate "Friends of Palestine"
Size of the sheet is 22.1 cm x 30.3 cm, - 8.5 ins x 12 ins. - Nearly all FDC's (West Bank and Gaza) are available. - We have some Revenue stamps for sale. We have a very limited number of this sheet. Contact us for details. We can supply SCHAUBEK albums with illustrated pages for all your West bank and Gaza stamps. Please send an email to us at palstamps@ziggo.nl for more information. First album: 1994-2013; second album 2014 and 2015. Price 750 €. ex. shipping. 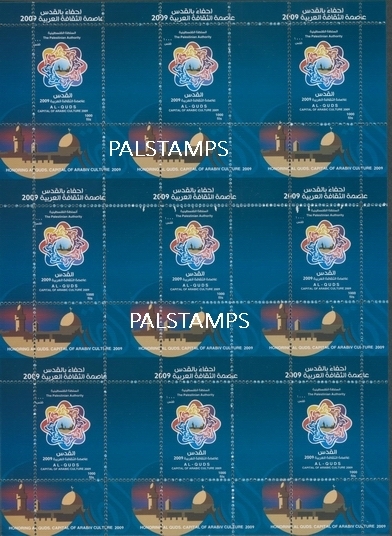 Palstamps numbers 37, 62, 66, 70, 96, 100, 104, 161, 211. These items are available, on neutral Lindner pages: price 90 €.